These months seem to roll around quickly! Yesterday my daughter and I did our monthly grocery shopping in the city. As usual, we met up with our friend, Audrey, for lunch at Tres Cantina. I don’t know what was in the air but all three of us ended up ordering some type of burger, something none of us have done on prior lunches there. I chose the one with green chilis, caramelized onions and jack cheese. Yum! We had a long, leisurely lunch and then Lisa and I got busy. We dropped off our glass recycling and then made a quick stop at Homeland, a regional, employee-owned grocery store. There are usually a couple of items we need which aren’t available at the other stores where we shop. We also check to see if they have any good sales in the small organic produce section. This time they did have a bag of organic lemons at a good price and we decided to split that. I also bought a pair of scissors for the kitchen since mine disappeared during Happyland Music Fest. Oh, I also bought a little travel sewing kit because I noticed a little tear in my skirt and wanted to fix that. Which I did. In the car. Next up was Dodson’s Natural Grocers. I did end up with one impulse buy – a bag of locally roasted coffee which smells amazing! I didn’t really need more coffee just yet but it will be used. We then went to Ulta because I was getting low on my perfume, Shalimar, and Lisa wanted to check out a few things. I also ended up getting some makeup brushes (had a coupon) and splurged on a skin care item. I think I’ll do a post about that later, maybe in one of my French Friday posts. Every few months we like to go on up to Oklahoma City so we can go to Whole Foods. It’s a tempting place so we limit our visits there and then hold our breath while our groceries are being rung up. We still had lots of rice, pasta, baking supplies, spices, frozen food and other basics on hand. In fact, my freezers and pantry are packed! Later in the month we’ll need more milk and perhaps some fresh produce from the farmers market but otherwise I think we are more than prepared food-wise for the rest of the month. Well, that’s all, folks. I’m sure Lisa will do a grocery haul post and when hers is up I’ll post the link here. 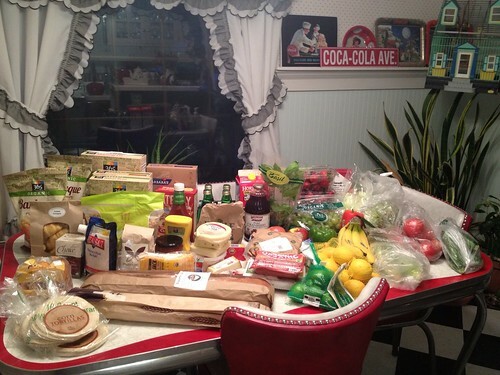 Update: Lisa’s grocery haul post. Now I’m going to go fix dinner (ham, pineapple and grilled cheese sandwiches with salad and fresh fruit). Afterwards, David and I are going to kick back and watch “Raising Arizona” which we haven’t seen in years. I had a filling at the dentist today which required FOUR shots of novocaine. I can’t take any pain medicine so I plan to open a bottle of wine after dinner and see if a couple of glasses will dull the ache enough to let me sleep tonight. *I’m still a little loopy from the nitrous so I’m going to use that as my excuse for the lack of consistency in mentioning which products were organic. Almost everything I buy on these monthly trips is organic. Exceptions are the Tillamook cheese which is a favorite of mine, the corn on the cob and artichokes, and the specialty cheeses. Deanna, you have me hooked on grocery haul videos. I'd never heard of them until you mentioned them. Would you say this covers your grocery needs for the whole month? That is a very good total, especially for such great food. They are strangely compelling, aren't they? In addition to what I have listed here I would have also picked up milk and some fresh produce (mostly lettuce which doesn't last long) during the month. I can't recall precisely what I did that long ago (ha!) but I'm sure I picked up a few other items here and there. I have a very well-stocked pantry and freezer, too.